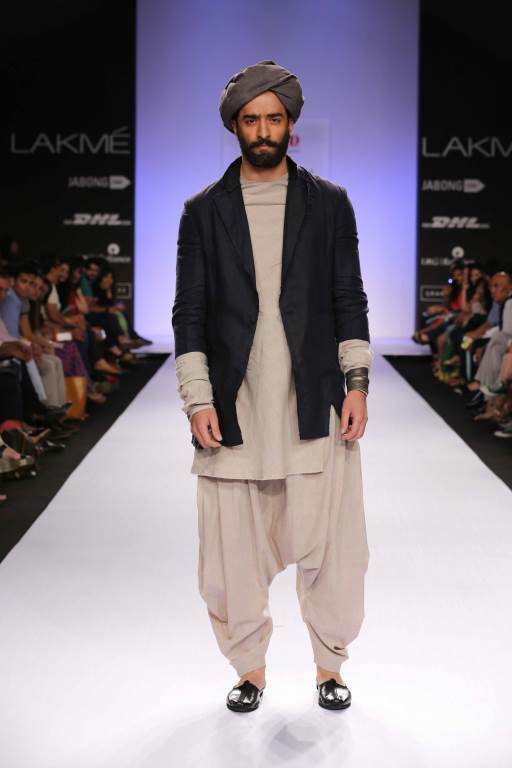 There was the complete male silhouette at Lakme Fashion Week day 1 that everyone was talking about. The guy knows how to steal the show and how to make everyone compliment you and talk about you. NIFT graduate Ujjawal Dubey with his label, “Antar Agni” created a sartorial men silhouette that takes inspiration from Middle and Far East. The collection titled “No longer the Hunted” revealed the rugged look that moved from woven to knits. The trousers were wide and roomy (for which I’d loosely use the term “Harem”) provided the Afghani male’s natural vibes. Natural shades of grey, black, beige and deep electric added excitement to the garments.See more pictures here.